Cognex Corporation, the leader in machine vision and industrial barcode reading, today announced the release of two high-performance 3D vision systems, the 3D-A5000 area scan 3D system and DSMax32T laser displacement 3D system, and a new method of 3D part location, PatMax 3D. 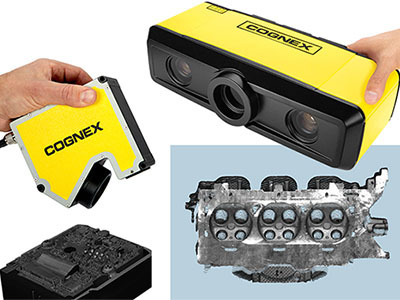 These three new offerings position Cognex to meet customers’ diverse 3D vision needs for 3D inspection applications, bringing superior 3D inspection to factories and manufacturers. The 3D-A5000 acquires detailed area scan 3D images in a fraction of the time of current methods, thanks to the patent-pending 3D LightBurst™ technology. This technology casts a unique blue light pattern onto the part, capturing a full field-of-view 3D point cloud image in under 200 milliseconds from over 1.5 million 3D data points. It enables higher throughput and shorter cycle times for time-critical in-line applications. The DSMax32T uses telecentric optics and unique high-speed laser scanning technology to acquire full frame, high-quality images. Combining data from 2,000 profile points, a full resolution, full frame 18 kHz acquisition rate, and advanced optics significantly increases throughput compared to traditional laser displacement sensors. Both the 3D-A5000 and DSMax32T feature IP65-rated housings that are built to last in tough operating environments. The industrial designs ensure consistent measurement results, even under varying temperatures. The systems ship fully calibrated and are ready to use right out of the box delivering accurate, repeatable measurement results in real-world units.